1a Green And Purple Extract. Recorded at Eastcote Studios on November 29th 2009 and January 25th 2010. 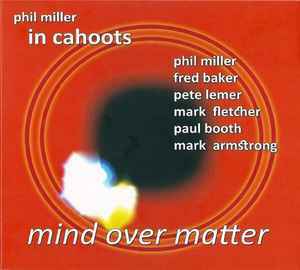 Five years have passed since the previous album "Conspiracy Theories" and finally comes a new album by guitarist Phil Miller and his band In Cahoots! Phil is a meticulous composer and it takes time to achieve the level found on this new album. We notice at first that a new horn section appears for the first time here, with saxophonist Paul Booth and trumpetist Mark Armstrong replacing respectively Picard and Finch. Then after listening to the album two three times, one general impression that struck me is the care taken to complex melodic voicings! Sometimes unisson lines form the theme, other times the melodic rose opens up in a harmonic contrapuntic motion, the chordal being the melody. A labour of love, impressive and emotionally working on the listener's fibers. The album starts with a gigant 18-minutes long medley of epic proportions. From the very beginning, some of Hatfield & the North's spirit caress your ear, the *theme* being here a long and complex chord progression opening the way to multiple harmonic modulations and a strong half-diminished feel. This is maybe the tune that is closer to progressive rock, with a massive heavy sounding guitar solo from Miller and a superb synth solo from Lemer; there are several sections where blow instruments take it away from prog and move it towards jazzier roads but we always come back to this massive harmonic sequence, the leit motiv of the piece. "Contrary Motion" offers what the title says: harmonized horn voicings against guitar movements and melodic bass walking, all in a kind of contrapuntal progression. After a guitar solo, the trumpet takes over at double time, followed by a bass solo, where we again can't but appreciate the phenomenal fretless work of Fred Baker. Follows "Pent Up", a piece in two parts, both in a 5/4 signature. Part 1 is marked by a rather slow tempo and some kind of bass ostinato while part 2 speeds it up in a Latin inflected style (the piano comping and piano/bass rhythmic line close to salsa / Latin jazz). The piece returns to the slow tempo at the end, ending with a great ethereal guitar solo. "Focus Pocus" is the only piece not composed by Phil, but instead by keyboardist Pete Lemer; based on a solid eighth note pulse, the tune has a middle section presenting you with a tough evil crossed rhyhtm of 24 eighth notes, divided by 6 by some players, by eight by other! And they keep it for the solos, not an easy task to accomplish! "E.D. or Ian" may be dedications to persons but who? This is anyway a charming ballad, at times sounding strangely like Oregon, maybe because of the meditative soprano sax and the wonderful horn voicings. Miller delivers here a superb plaintive guitar solo. The ending is wonderful, combining sustained guitar tones and a myriad of bass harmonics. "Call Sign" closes the album, starting with a rock-solid rhythm but moving in a boppish vein during both sax and trumpet solos. The bottom line: the writing of this album is superb, the music stunning! But - yes, there is a relatively important *but* - my biggest concern is about the production side of the album! There is nearly throughout a nasty disturbing use of reverberation that imo partly kills the music or at least amputates the pleasure! Too much of the music is drowning in this reverberation; the price? it takes some of the drums attack, the instruments when soloing seem at time to shift from a wet to a dry sound within no time, like if the engineer was randomly turning the knobs, every instrument seems placed dead center in the stereo field, bumping on each other, muffling the sound, masking small details. The most hearable place of this weird balance is attained during the piano solo in the ballad number; it seems like the keyboard's aftertouch function triggers both the extra sound but also this damned reverb, suddenly invading everything. Honestly, I think this is a pity and could have easily been avoided. If you want to minimize this aspect, you'll have to listen at lower volumes; if you like it loud, you can't avoid being badly wet! Another production aspect is that Baker's bass at times jumps way too much upfront in the mix, becoming too dominating and again altering the placing of the other instruments in the stereo field! I'd like to know what the conditions were when they tackled the production; I don't remember having faced this kind of problem in previous releases!